Let me offer you our Golden Angel 2 bedrooms and air-conditioned Apartment with the very city centre of Prague right around the corner. The apartment was recently restored and reconstructed to meet the high standard of our guests staying in. It has two bedrooms with comfortable double beds and wardrobe for your clothes and a spacious living room with sofa and dining table. Kitchen is fully equipped and has all utensils/appliances you might need for your own cooking. Fridge, diswasher, washing machine (together with washing powder and softener) etc. are commonplace to ensure your stay is like at your own home. During warm summer the air conditioning in both bedrooms and also living room is a nice touch. First time in Prague? To make your first stay smooth we would like to offer a transport from the airport/train station to take you to the apartment where I will personaly meet you to show you the place and everything around and to answer all possible questions concerning your stay you might have. The price for the taxi ride is 650CZK from the airport/400 CZK from the train station. The Old Town area and Wenceslav Square are reachable either by nice stroll around the Vltava river (around 40 minutes) or by underground which is just 14 minutes long way - a few stops. In case there are more of you in your party, we have other one bedroom apartment in the same building that sleeps 3 and other apartment that sleeps another 4. If your Prague Holiday plans are ready and you like our apartment, dont hesitate to contact us to be the guests in our fantastic place. I will be here personally to ensure that your holiday is as pleasant and unforgettable experience as possible. I will also provide you with a map and plenty of leaflets about Prague's beautiful sights. I very much look forward to meeting you and welcoming you here in Prague. There is a guarded parking lot 3 minutes walk from the apartment for the price of 15EURs per day (24 hours). Childs highchair only available upon request.. Thank you Monika and Petr! Very nice 2 bedroom unit near Prague’s Center City.. access via subway is 15-20 minutes .. several nice restaurants in Andel area ..
Great place for 2 couples! Had a blast in Prague- thanks for sharing your wonderful place with us! Zeer geschikt om Praag vanuit dit appartement te verkennen. Het centrum is prima te voet te bereiken. Appartement is mooi. Hygiëne liet iets te wensen over. Het doucheputje bleek niet schoongemaakt waardoor het water niet wegliep. We hebben dit zelf opgelost. Eigenaar heeft wel dezelfde dag nog een presentje gebracht voor dit ongemak. My cousin and I stayed in this wonderful apartment for 4 nights. We came during a heat wave and the air conditioning worked great! The beds were comfortable, and the place was clean and quiet. The home has been very recently remodeled. It felt new. The bathroom was really beautiful. Nice soaking tub, with a waterfall, to wash your feet. The seperate shower had all kinds of jets. The kitchen was also very nice and modern, although we didn't eat in, so it didn't get used much. It had everything you would need. The washing machine came in handy too, with a drying rack. There are good restaurants all over Prague. There were also a few places for coffee and pastry very close to the apartment, along with restaurants, a brewery, and a grocery store very close by. There is a Bistro upstairs from the store, that was good for salads and a sandwich. The locals eat here. There was a long line. The neighborhood is not in a tourist area, but very convenient to public transportation. I like being part of the locals when I travel, even if it may not be as picture perfect. My cousin and I walked to the Old Town square, and other sites without the use of public transportation, a bit of a walk, but doable. (we are seniors) One of the highlights of my souvenir shopping when in other countries, is buying locally made perfume. We found this small little shop called Perfumed Prague and had perfume made especially for us, a new experience. So fun!! The Dancing House is just down to the river from the apartment and then a pleasant walk along the river and across the bridge. Thank you Petr, for picking us up at the airport, and taking us back, it made getting to and from the airport stress free. Thank you Monika for always answering our inquiries quickly during our booking. I know that if I had any issues (there were none) that you or Petr would have answered back right away. Fantastic hosts. 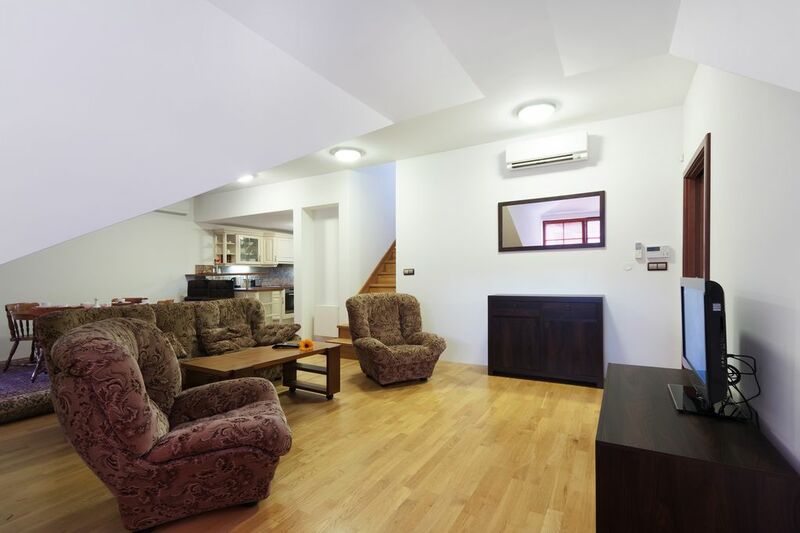 I would highly recommend this apartment to friends and family who are going to visit Prague. What a great time we had in this beautiful city! !